LAHORE: Umer Khan a 19-year-old left-arm spinner. 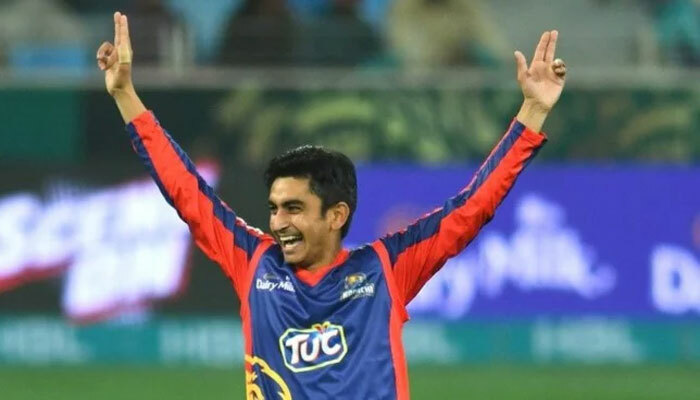 Born in Rawalpindi he grew up in FATA (Federally-Administered Tribal Areas, on the border with Afghanistan) is near the biggest wicket in Twenty 20 cricket. Two balls is all it took in getting AB de Villiers to hole out from the second ball bowled to him by a young not so experienced 19 year old player. Even though Umer’s team Karachi Kings lost the game to Lahore Qalandars but in getting AB de Villiers was a moment and a game he is unlikely to forget. Umer's story is almost tailor-made for the PSL. He used to bowl against as stumps for hours on end. He was first spotted by PCB coaches in Pepsi Cricket Stars Under-19 programme in 2014 and selected for FATA, though he didn't get a chance to bowl in a two-day drawn match. He later resurfaced on the Under-19 inter-district circuit in 2016 and was elevated to inter-region under-19s and that same year, made it to the Pakistan side for the ACC Under-19s Asia Cup in Sri Lanka. Umer wasn't picked among Karachi Kings first 20 players but teams are allowed to pick a 21st player from their own scouting and development programmes. Having tracked Umer's development, Rashid Latif, one of the franchise director who isn't with the team for this season, vouched for him as a potential and deserving player. He's already impressed Karachi Kings coach Mickey Arthur. "I thought he was outstanding tonight," Arthur said. "He has really impressed us. We've been together about a week now and he's impressed me hugely. Good attitude, wants to learn and he's a very skilled bowler. He almost seems ahead of his time."